College Coach? Click here to view all of Chayanne's information. 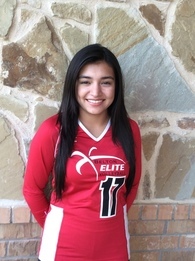 I play club volleyball for TCA central Texas on the 18's national team. Jersey #34 I absolutely love the way playing the game of volleyball makes me feel. As I take the court to begin each new game I still feel that same excitement as I did seven years ago when I first picked up a volleyball. Volleyball has taught me many lessons, one of which is, if it is worth having it is worth working hard for. You can never work too hard and giving up is never an option. I have learned the true meaning of teamwork. I pride myself in having great court awareness and great ball control. I aspire to be educated continue to play volleyball and stay fit & healthy. As far as my career choice I am still undecided. I have thought of teaching and possibly being a volleyball coach. Notes: My club is located in Robinson Near Waco Texas, although TCA is only in its second year in Central Texas they are nationally known and established in Houston Texas.